Where do I use my Natural Collection voucher code? Choose from the latest offers available on our website and click on 'Get Code' on any discount you want to use. Copy the code that appears and use our link to go to Natural Collection's website. Browse for your goods and add the items you'd like to your shopping basket. Click the basket icon to checkout and log in or create an account. Fill in all the details required and continue through to the payment options. Paste your promo code into the ‘Your Code’ field provided and click 'Apply Code’. 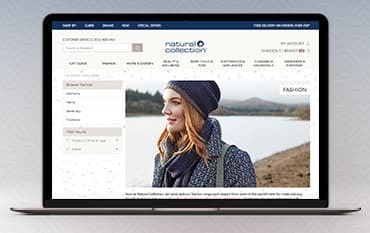 If you are keen to help save the planet, then the Natural Collection website is the go-to shopping site for you. At Natural Collection, you can choose from a huge range of the best quality fair trade, organic and eco-friendly products. Many products are made from recycled materials or are certified cruelty free. Every product is tagged with its ethical credentials, so you know exactly what you are buying. Even their packaging is as eco-friendly as possible. Shop here for fashion, home and garden products, beauty and wellbeing products, baby care and toys, electrical appliances, cleaning products and groceries. At Natural Collection, you will find a new hand-picked fashion range every season from some of the best fair trade and eco-friendly fashion producers in the world. Garments combine the latest on-trend styles with natural and comfortable clothing that needn't cost the Earth. So if you are looking for an organic dress, ethically produced shoes or a fair trade t-shirt, you are bound to find what you are looking for at Natural Collection. When a product displays the Fairtrade Label you know that it will meet certain social standards that have been put in place by the Fairtrade Foundation. Everything you find on the Natural Collection website under their Fairtrade section has been certified Fairtrade by the foundation. This means that they contain ingredients that have been grown on Fairtrade farms and that they are produced to Fairtrade standards. This ensures that the workers who have made these products are paid a fair price for their goods while guaranteeing a premium that allows money to be put back into the local communities in order to support social, political and environmental projects. Here you will find Fairtrade clothing, foods, beauty products and more. The best way to identify a completely cruelty-free product is to look for the Leaping Bunny symbol. This symbol means that it has been certified by Cruelty-Free International. This organisation is the only certifier of cruelty-free cosmetics and household products that are internationally recognised, so you can be 100% sure that the product is truly cruelty-free. This certification guarantees that the products that you are buying have not been tested on animals and that the companies that manufacture them meet the strict animal testing policy of Cruelty-Free International. On the Natural Collection website, they stock cruelty-free certified brands like BullDog, Faith in Nature, Method and Bio D.
How can I be sure that your products are ethical? We always evaluate a manufacturer's overall ethical credentials when deciding whether to sell a particular product. When a product has received an ethical claim, verified or certified by an independent 3rd party organisation, we will always share that information with you. Ultimately it is your choice what to support in your ethical purchasing. Please let us know if there is a particular brand or product that you feel we should either support or stop supporting. You can return any items, you are not satisfied with, within 30 days of receipt and we will either refund or replace them. They should be returned in their original condition, including packaging. Please include a note in your parcel, giving the reason for return and tell us whether you would prefer a replacement or a refund. We recommend that you obtain proof of postage as we cannot accept responsibility for ang goods lost in transit. We can arrange to collect your package for you at a cosyt of £5. Please send your parcel to Natural Collection Returns, PO box 1000, Gateshead, NE85 2BS. How can I be sure that products are Vegan? We stock a large number of vegan products, many of which have the Vegan Society certification printed on the packaging. Please note that products can sometimes end up here accidentally so we advise that you always check the packaging to double check the ingredients. Please let us know if you think that a product has been incorrectly labelled as vegan, via the "ask a question" button on the product page. Going all-natural can be a struggle as commercial brands rarely offer products supporting your lifestyle. With Natural Collection, you can find all the things you need, such as fashion, furniture, home accessories, toys, cleaning products and beauty products. All Items are made from ecologically-considered products, making them greener for you and the planet. To get the best value, check out all of their Natural Collection promo codes and money saving offers here at NetVoucherCodes.